This review has not yet been approved by the owner of this writing service. If you are the webmaster of Essaythinker.com, please Contact Us to approve or remove this review. The website is adequate, albeit rather generically designed. 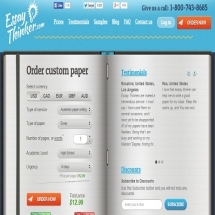 Price calculator is functional and provides detailed information on how much different kinds of work cost, allowing you to find out whether you are willing to pay that much to the service, there are samples giving some impression of the writing quality, FAQ is reasonably competent in providing the necessary information – in other words, nothing outstanding in either good or bad sense of the word. Prices are very flexible and depend on the kind of assignment, academic level and degree of urgency. If one takes academic writing from scratch as an example, prices range from $12.99 per page for High School level assignment due in two weeks to $47.99 per page for PhD level due in 6 hours. The difference between the two is probably somewhat smaller than one would expect, but in general seems to reflect the difference in levels. Some other types of assignments (proofreading, copywriting, dissertation writing) have different amplitudes of costs, you may see them for yourself on the website. Customer support is seemingly available via phone, online query form and email; but so far I am not even sure if they have customer support as such, for I haven’t managed to reach them even once, no matter which way I used. Judging by the samples presented on the website, the quality of writing offered by the service is rather mediocre, at least for college-level assignments. There are no blatant grammar or syntax mistakes, but both the style and contents are bland, uninteresting and commonplace – perhaps premium level writers can deliver something better, but the service certainly doesn’t go out of its way to present itself from the most favorable side. • Detailed money back guarantee covering all eventualities. In most respects EssayThinker looks like your average writing service without any particularly damning shortcomings or exceptionally attractive features. However, the fact that their customer support is either non-existent or very, very slow on the uptake means that one should think twice before trying to order anything here.